A series of coincidences and near-misses will result in the publication this autumn of a book on one of Saltaire's great mysteries, writes Richard Lee-Van den Daele. Back in 1996, my interest was sparked when I discovered the ruins of the once great local mansion, Milner Field near Gilstead. Coincidentally, David Beale from Baildon also stumbled upon the ruins. Unknown to one another, we began pondering the story that lay behind the evocative pieces of carved masonry strewn on the isolated hillside overlooking Saltaire. Separately we visited the local library and archives in an attempt to find out a bit more on a Saltaire story that seemed none-too-well charted. When I visited Shipley library one day to do some more research, I was asked by the librarian whether I was working with the “other man who's been in looking into the history of Milner Field”. Well, I wasn't, but I soon made a 'phone call to the number David had left to find out who this other researcher was. We met up shortly afterwards and our joint enthusiasm resulted not only in a firm friendship but, at this year's Saltaire Festival, the product of those years of research will culminate in the launch of the book on which we’ve collaborated: “Milner Field: The Lost Country House of Titus Salt Junior”. We had been amassing quite an archive for ourselves when, by chance, we met local businessman David Weber, whose passion for Saltaire and interest in the mysterious house on the hill matched ours and whose technical skills meant that the idea of a book on the subject was soon taking shape. We felt sure that the elements of the story that intrigued us would also fascinate many other people and we were surprised that this engrossing story hadn't really been told in full before. 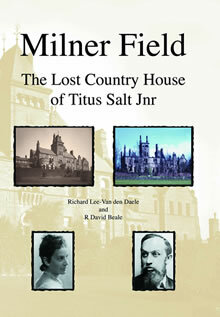 Milner Field, built for Titus Salt's youngest son, was a magnificent edifice with two towers, a courtyard enclosed with an imposing Gothic arch, a massive 500 square yard conservatory with intricate mosaic flooring, manicured grounds, a boating lake and well-stocked kitchen gardens. Graced by not one but two royal visits, the house stood at the centre of genteel local society, but in the matter of a few short years early and mysterious deaths and bouts of seeming ill-luck cast a long shadow over the place. After 1930 the rambling house was never again to be occupied by a Managing Director from the mill and it would soon begin its descent into becoming a gaunt and roofless ruin, gaining its own ghost in the process, before meeting an ignoble end in the 1950s. David Beale and I have amassed many local stories from those who recall the house, and we share the unique access we have had to the Salt family's private archive of photographs, correspondence, paintings and artefacts. Our research has also put us in touch with the families of former Managing Directors who lived there and their recollections and never-before-published photographs also appear. For the first time ever the history of the house and its occupants are charted in one book and it is richly illustrated with many fascinating images of the house and grounds, from its sumptuous Victorian interiors, the estate viewed from the air, to the privileged lifestyle enjoyed there as late as the 1920s. The rare sale catalogues for the house are also reproduced in full. In an appendix the stories of two other long-vanished local mansions with Salt connections - Charles Stead's, The Knoll, and Edward Salt's, Ferniehurst at Baildon - are also told, together with a study of Milner Field's kitchen gardens and the landscape designs carried out by Robert Marnock, one of the most important nineteenth century exponents of the 'gardenesque' style. The book will be published by Barleybrook Ltd at will be launched at the Saltaire Festival in September 2011.